The ROI of Social Media was written for marketers on how to strategically design, develop and implement a blended traditional and social marketing program that can be monitored, measured and connected to your bottom line. Published by John Wiley & Sons in 2011, it has become a stable on the professional marketers bookshelf as the reference for how to construct and manage a social marketing presence using ROI as a foundation. The genesis of the book was from a discussion between Guy Powell and Steven Groves, starting when Guy found Steven via a connection on LinkedIn. At the time, Guy was looking to have a question answered about a particular online marketing tactic he was proposing. The ensuing conversation had them talking about how Guy’s background in marketing ROI and Steven’s background in social media might be married to create a manuscript around the ROI of Social Media – it turned out to be a very productive turn of events indeed. Using Skype on a daily basis, Steven and Guy worked out the foundational elements of the book and Jerry Dimos was recruited from Singapore to round out the team with a greater focus on international marketing strategies. A book proposal was generated and sent to John Wiley & Sons / Singapore and an agreement was reached to have the manuscript written on March 15, 2010. Using Google Wave (remember Wave?) as a collaboration tool to connect Guy in Atlanta, Jerry in Singapore and Steven in Phoenix, the team set out to creating a relevant and strategic work on the ROI of Social Media and from that foundation we developed a framework that marketers could reference and put in place to help monitor and manage the process. Research for the book was done leveraging he co-authors background in marketing ROI, social media and marketing strategy. We approached some of the top brands and best marketers in the world to ask them how they used social marketing to connect with their audience and how they measured ROI in their marketing efforts. We also connected with some of the premier social monitoring tool developers and asked them to share what it was their tools did, even to the point of using the technology for client engagements. One result of the research was a far-reaching series of podcasts (estimated at over 50 episodes so far), blog posts and transcripts that are published here and the ROI of Social Media community site and are be referenced in the book as case studies on the state-of-the-art for social media implementations and the tools that support them. 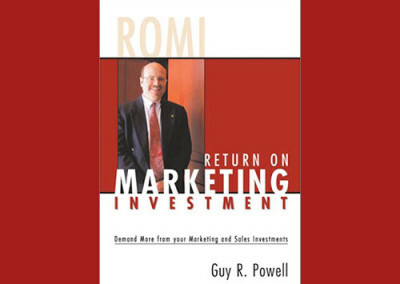 Guy R. Powell is the President and founder of DemandROMI where over the last 20 years he has helped clients from across the globe build highly successful and measurable marketing strategies to drive increased revenue, profit, brand and share. As part of his consulting activities he has trained and/or presented his findings and methods to thousands of marketers across the globe. His consulting career began with ATKearney delivering strategic and tactical solutions to help companies fuel and maintain extraordinary growth for mid-tier and Global 1000 companies. He has experience with many Fortune companies in sectors including CPG, financial services and high technology. Powell’s educational background includes an MBA from the University of Chicago and a BSEE from Lehigh University. Steven W. Groves is the CEO and lead consultant for Social Marketing Conversations. As author, podcaster, blogger and digital polymath, he has worked with some of the most remarkable brands in social marketing and social media. He has consulted with a wide range of global industries on marketing and business development needs—consumer product goods companies, authors and publishers, real estate professionals, non-profits, banks and software companies. A sought-after speaker, Steven opened the 2010 Phoenix SCORE Social Media Conference, the “Social & Traditional Marketing” track for the 2010 Online Marketing Summit and the Arizona Small Business Association (ASBA) Social Media Symposium in 2009. He has lectured for ASU in the Barrett’s Honors College for Entrepreneurial Education. Jerry Dimos is a Partner with The LiTMUS Group heading up the Singapore office. With more than 15 years of management consulting experience centered on strategy, growth and performance improvement programs for Fortune 500 companies, he has delivered successful projects across Asia Pacific playing major roles in improving the performance of complex, global organizations, delivering strategic and operational improvements within the banking, insurance, energy and consumer products sectors. Jerry has an MBA from the Chicago Booth Graduate School of Business, a Masters from the School of Engineering, University of Sydney and Post Graduate Degree in Information Technology from the University of Technology, Sydney. Jerry is a Chartered Management Accountant, a Certified Management Consultant and has been a contributor to many industry standards. 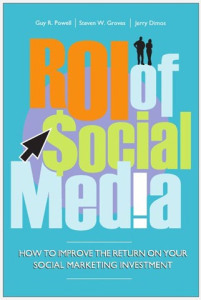 If you are looking for an easy read and quick recipe for ROI of social media this book is not for you. But if you are looking for a comprehensive review of what ROI of social media is and how to set up a social media measuring strategy for your company, definitely get this book. Measuring social media activities and analyzing them for business results is a relatively new field with measurement technology that is still catching up to our needs (I experience it every day in my role as social media strategist for a large B2B company). Having a framework to address these shortcomings will set your strategy apart from others who stop short of counting followers and fans. My favorite: 15 case studies (one of which is about my employer, Pitney Bowes 🙂 that have been compiled to illustrate different measuring approaches. 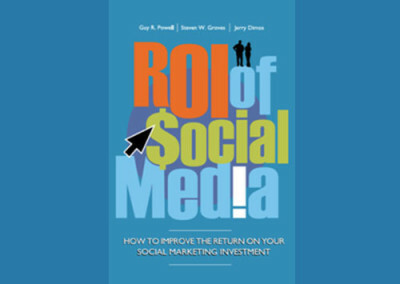 Guy, Steven, and Jay have written a great overview of ROI in general and with specific application through concepts and case studies to the area of Social Media and more broadly user generated content (UGC). The ROI of Social Media is a must-read for any business looking to get the most out of their investments in social marketing. It sets the stage for marketers to interact with influencers, individuals and consumers and explains the relationships between them. This book breaks down into simple terms both “dollars” and “sense” for social marketers to live by. Fundamentals, strategies and tactics …this book has it all. The ROI of Social Media will be the dog-eared book that sits on the corner of your desk used to prove many a point. Analytics are the core to a consistently successful marketing program. 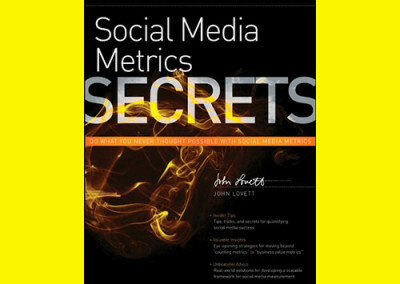 This book offers the metrics to manage social marketing programs, to measure their success, to diagnose underperforming elements, and to deliver extraordinary results. Kudos to this team of marketers in putting this essential book together. This book more than adequately covers this increasingly important topic, as social media begins to take its rightful place on the center stage of not just marketing but a number of business disciplines. ROI of Social Media is an excellent analysis of the current landscape. 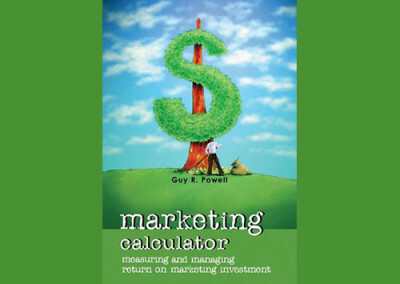 I cannot recall any book that singularly tackles ROI at this level, most media books simply give a passing reference or chapter on ROI, this is the first comprehensive study. I have been doing a lot of research on social media and how businesses can use it to sell more products and services. This book provides a reality check that is most helpful. Instead of dabbling with social media, this book provides the techniques to get serious about social media and where an organization is in its social media journey. There is so much out on the blogs and website articles about social media that it is overwhelming. I run into people constantly giving me their two cents about the trends and what is hot in social media and it is confusing. If you are at all confused or feel uncertain where to start with social media then I would start with this book. The book provides techniques such as the media engagement framework. The MEF provides the context as to where to get your arms around using social media within your organization from the perspective of personas down to how to measure each persona (influencers, consumers, individuals) and the way to appropriately reach them with the best return instead of grabbing the coolest thing on the market. The entire subject of ROI is often a half baked attempt to provide enough cause to do something. In other words, ROI is not real as it is based on possibilities or intangibles. Real ROI is based on hard dollars not soft dollars. I applaud the authors for taking the position of defining ROI specific to social media with how to approaches. As a marketer and not a finance person, I appreciate the business mechanics of generating the ROI rather than a lot of financial calculations that would leave me trying to figure out how to apply social media to the calculations. The book does a fantastic job of applying ROI as would be expected by the title and it lives up to that title. Other aspects of the book are the web links to current articles and findings on the web. There are case studies, tools to use, and side bar definitions that make the book a very useful guide. I hope the authors keep the book up to date as tools and trends change, however, the frameworks and approaches will have a decent shelf-life that I would encourage anyone to read in 2011 and for the next several years. We know that for 2011 and the foreseeable future, ROI is one of the top priorities for the social media strategist at many companies, ROI of Social Media is the right book at the right time as social media strategist are needing to work the various department within the enterprise and show that the investments in social tactics and tools are a good investment. The 15 case studies contained in this book will help the social media strategist understand how global brands are successfully using social marketing to connect to their audience.